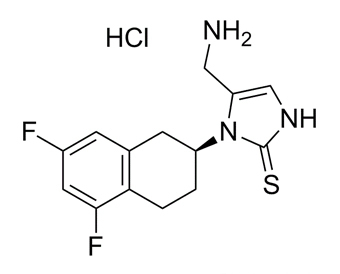 Nepicastat, also known as SYN117 and RS-25560-197, is an inhibitor of dopamine beta-hydroxylase, an enzyme that catalyzes the conversion of dopamine to norepinephrine. It has been studied as a possible treatment for congestive heart failure, and appears to be well tolerated. As of 2012, clinical trials to assess nepicastat as a treatment for post-traumatic stress disorder (PTSD) and cocaine dependence have been completed. In Phase 2 study treatment with nepicastat was not effective in relieving PTSD-associated symptoms when compared to placebo. Nepicastat (SYN-117) HCl is a potent and selective inhibitor of both bovine and human dopamine-β-hydroxylase with IC50 of 8.5 nM and 9 nM, with negligible affinity for twelve other enzymes and thirteen neurotransmitter receptors. Phase 2.
. Stanley WC, et al. Catecholamine modulatory effects of nepicastat (RS-25560-197), a novel, potent and selective inhibitor of dopamine-beta-hydroxylase. Br J Pharmacol. 1997 Aug;121(8):1803-9.
. Stanley WC, et al. Cardiovascular effects of nepicastat (RS-25560-197), a novel dopamine beta-hydroxylase inhibitor. J Cardiovasc Pharmacol. 1998 Jun;31(6):963-70.